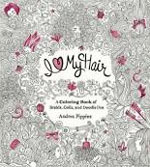 When Pippins was in graduate school, she created this coloring book for women to help them celebrate their hair. The hairstyles feature people famous for their hair (mermaids, Egyptian queens, Marie Antoinette, Diana Ross) and hair of different lengths. Faces are often not shown. Instead, accessories like flowers, feathers, beads, barrettes and ribbons add fine detail to the page. There is enough blank space on the page for the colourer to add their own embellishments. A few of the pages are collages of words which describe how one might feel about their hair (wild, sweet, elegant, soft) or how one might style it (pinned up, curl, trim, shave, plait). There are no males in the book. This coloring book is advertised for women, but I think children ages 5 to 12 could enjoy this coloring book too. The cover includes pink foiled highlights that young girls would find appealing.